Occasional Skeptics attendee Katie Steckles is this year's science communicator in residence, and is running the Megapixel project, which aims to demonstrate how a computer display works using pens and a massive window. She also gave the Josh Award lecture (which you can't go to because it's in the past). Katie is also running After School Science Club again, this time on the theme of colour. Engineering Showoff is this Wednesday, and features engineers turning their hands to comedy, including GMSS webmaster, me. Also on Wednesday, the Robot orchestra is performing. There are several days of competitive science demonstration at Science Showdown. 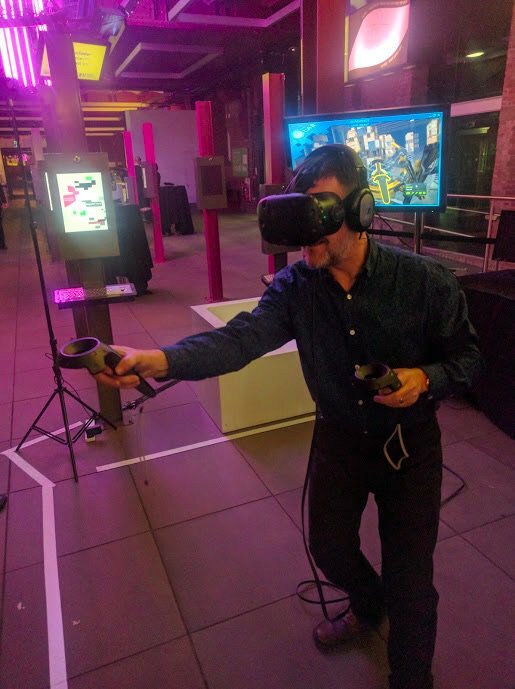 Lastly, if you want to look as cool as our noble leader Geoff does here, find the Virtual Reality Playground this afternoon. The space-station repair simulation is very good. Check out the full listing for more events that aren't all in the past already.